An action-packed book with two wind-up model racing cars to race against each other on the tracks embedded in the thick card pages. With fun facts about racing cars and pit stops and the world of racing. 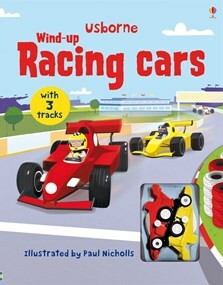 Following on from its hugely successful Fire Engine and Airplane, Usborne has a Wind-Up Racing Cars, by Sam Taplin, with not one but two cars ready to hit the track. This will keep little ones entertained for hours and dads too who can do the winding up! Ideal for young speed demons. You can even race the two little cars on the tracks within the thick card pages.